Cairo (Agenzia Fides) – Al Azhar University, the most prestigious theological and academic center of Sunni Islam, strongly rejects the criticisms and attacks recently received by Egyptian politicians and intellectuals who point their finger against the programs of its teaching courses, accusing them of contiguity with the aberrant ideologies adopted by Jihadist terrorism. 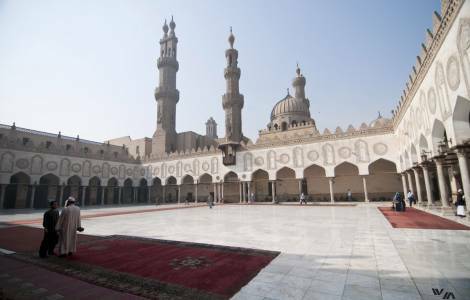 In an official statement issued on Tuesday, April 18, the Supreme Council of al Azhar scholars wanted to reiterate that "Sharia prohibits every kind of assault against human beings, regardless of their religion and belief", and "Islam also binds Muslims to protect all places of worship and to treat non-Muslims with kindness. With regard to the more detailed allegations concerning the Sunni University teaching programs, the statement points that "al Azhar programs are the only ones which teach Islam in the right manner and favors peace and coexistence among Muslims and non-Muslims, as witnessed by millions of diplomats who have been and are advocates of peace and brotherhood". Introducing the teachings as an incentive to terrorism - says the statement sent to Agenzia Fides - represents "a distortion in Egypt's history and a betrayal of Egyptian consciences". The statement by al Azhar scholars has led to further criticism by intellectuals such as writer Khaled Montasser, who defined the pronouncement as "the last nail of the coffin of the rule of law in Egypt". While Coptic intellectual Naguib Gabriel, leader of the Egyptian Human Rights Union, noted that the problem of teaching programs not only affects courses taught at al Azhar, but also books and Arab language study courses, which also force non-Muslim students to memorize the verses of the Koran and the Hadiths of Prophet Mohammad.